Warm up and stay cozy with this Spiced Pineapple Rum Hot Toddy! 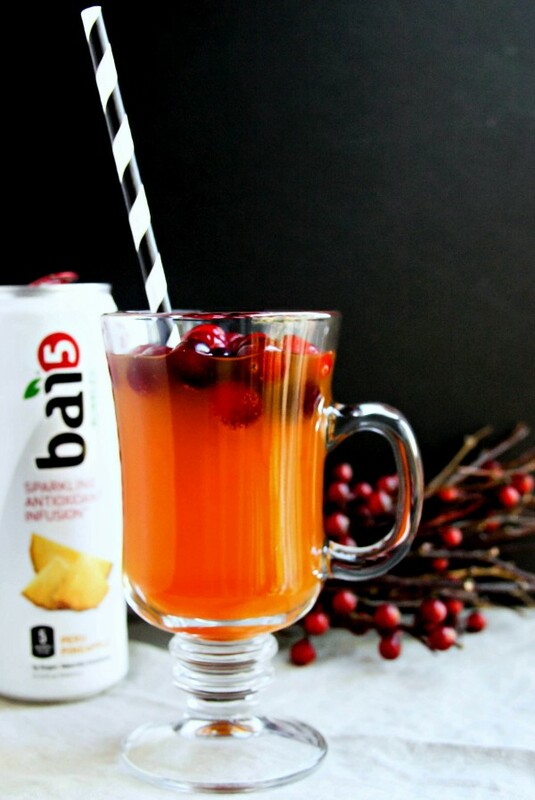 It’s the perfect festive Fall/Winter drink to soothe the body or to simply enjoy with good company. 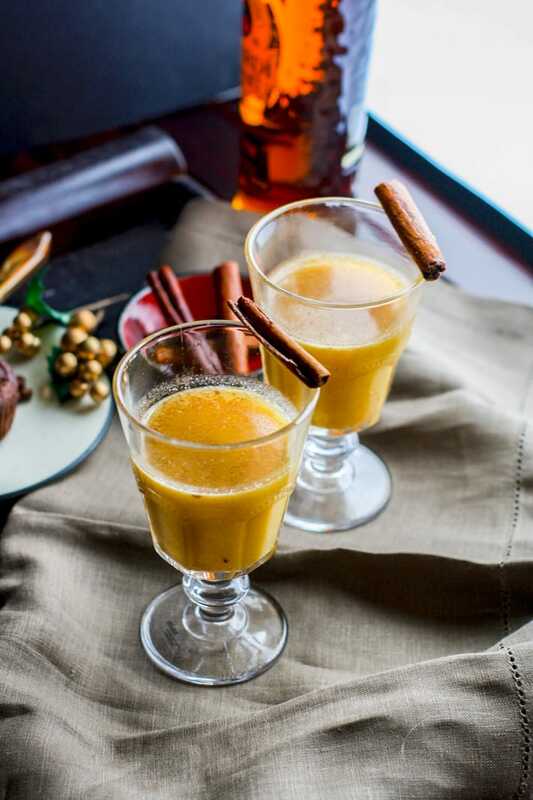 This spiced pineapple rum hot toddy is made with natural sugars and a touch of cinnamon and coconut milk for healthier Holiday sipping! ENJOY! Can we say CHEERS to Friday? Yes, yes we can! Especially with today’s Spiced Pineapple Rum Hot Toddy Recipe. But first, I must explain something here. You see, we ended Friendsgiving with these desserts but honestly, I can’t end a meal just with dessert. There’s gotta be something more to linger and sip on while we celebrate a good meal and good company. Hence this drink. I know what you’re thinking. A hot toddy? Please. That’s a medicinal drink. Yes it is, but this one has many purposes. More than medicinal. Ready to hear me out? WHAT IS A HOT TODDY? Thanks wikipedia –> is typically a mixed drink made of liquor and water with honey (or, in some recipes, sugar), herbs (such as tea) and spices, and served hot. Hot toddy recipes vary and are traditionally imbibed before retiring for the night, or in wet or cold weather. Some believe the drink relieves the symptoms of the cold and flu . 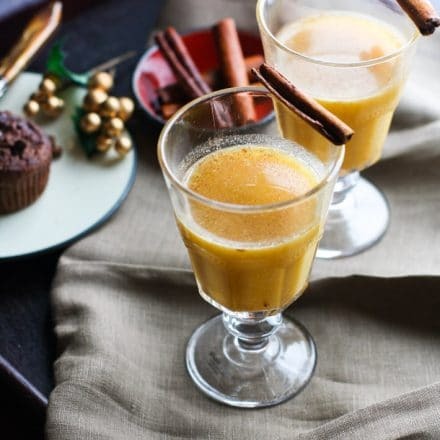 My ideal purpose for this recipe was to combine the yumness and chillax factor of a Hot Butter Rum drink with the Medicinal purposes of a Hot toddy. But I also wanted this drink to be somewhat healthy for digestion. I replaced the extra sugar with pineapple juice. Which also happens to contain bromelain, an enzyme that can help breakdown protein for better digestion. 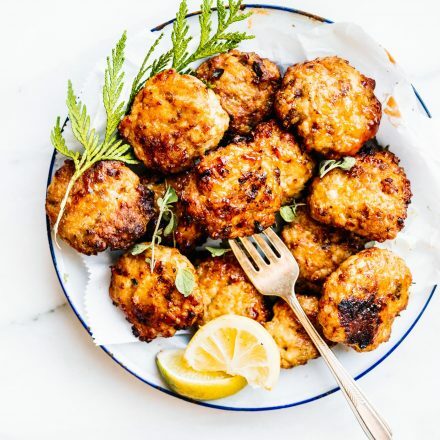 It also has anti-inflammatory properties is loaded with Vitamin C. On top of that, a serving (1.5 -2oz) of rum is gluten free and has been shown to provide anti-microbial properties which may help when suffering from common cold. Can we say SUPER FOOD? Yes! I don’t know about you, but I’m happy to drink to that. 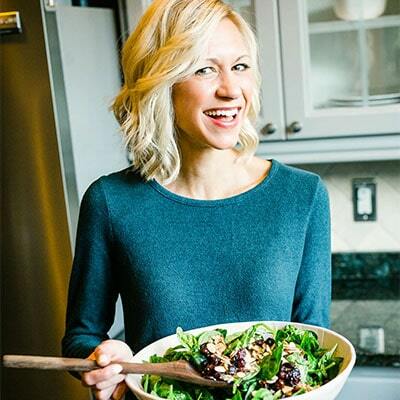 Healthy digestion, which we all are going to need after a big holiday meal. Healthy immunity, because it is cold and flu season. I’ll take all the immunity boosting factors I can get (hot toddy being that the bonus booster). 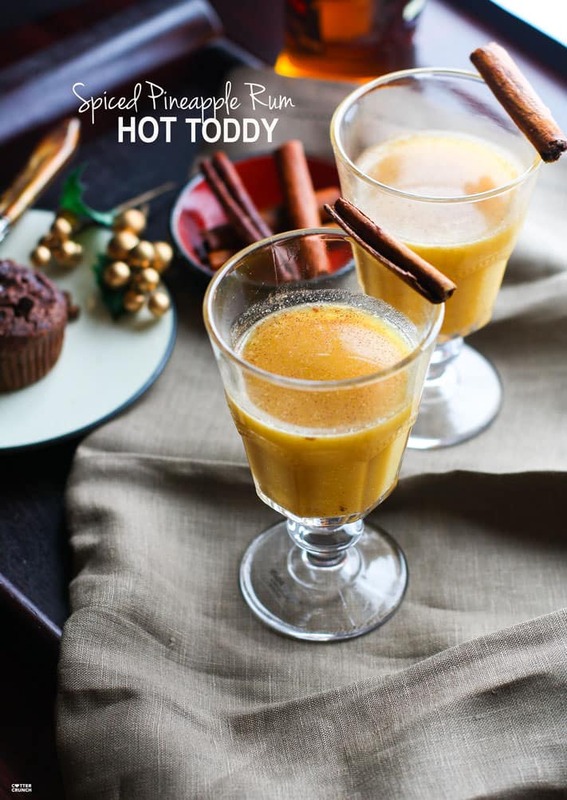 Spiced Pineapple Rum Hot Toddy! 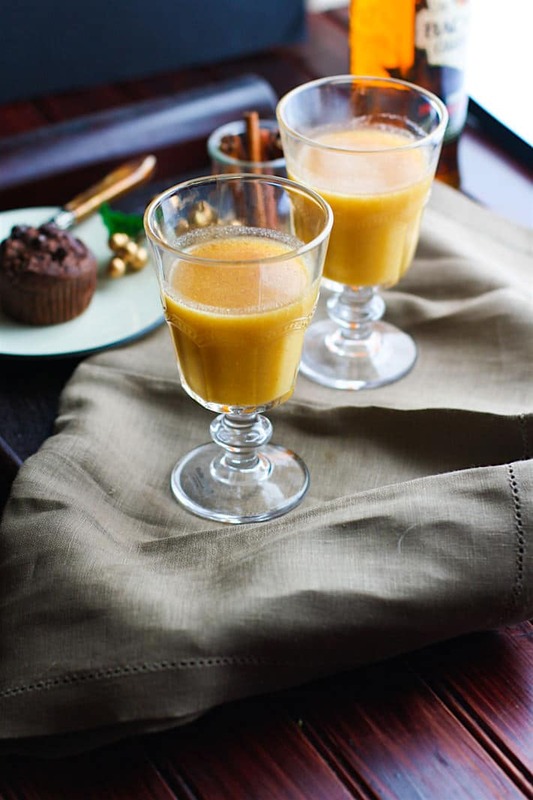 It’s the perfect festive Fall/Winter drink to soothe the body or to simply enjoy with good company. Place pineapple juice concentrate and water in a pot on stove. Simmer on medium until pineapple concentrate, rum, and water blend and mix together. Add in your cinnamon stick, vanilla, honey, salt, and cinnamon, and let is simmer more on low or medium low for another 5 minutes. Serve into 2-3 glasses and then add in 1 to 2 oz of coconut cream to each glass. Stir with your cinnamon stick and add more cinnamon on top if desired. 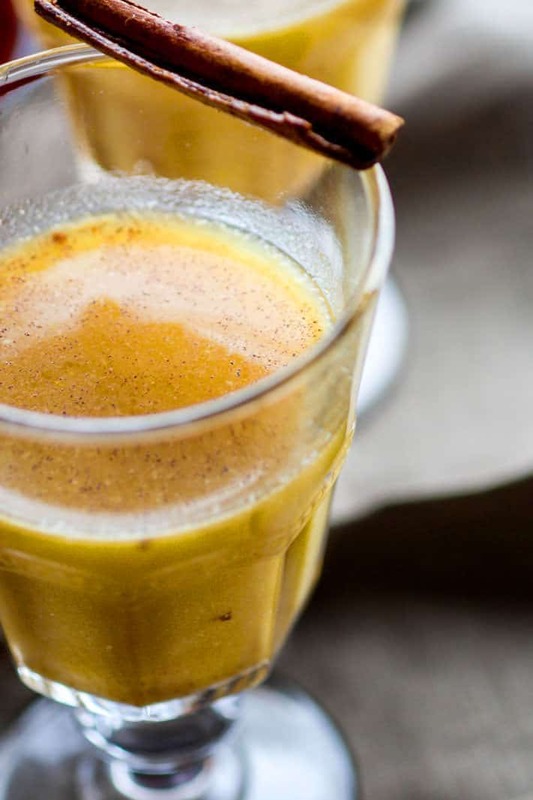 This Spiced Pineapple Hot Toddy is DARN TASTY and so SOOTHING to drink! A drink you want to nurse on over a period of time. 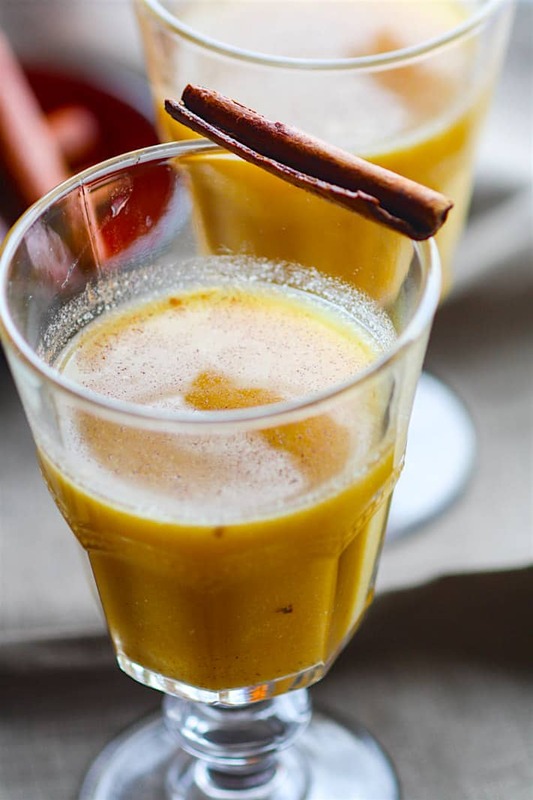 If you walked in the kitchen while I was making this for you, you’d smell the sweet aroma of citrus all bundled up with cozy cinnamon and a hint of honey. Just imagine that for a second, mm k? Like if you came for friendsgiving and we all hung out post meal and enjoyed a drink together. And when I say drink, I mean one glass. Come on now, we don’t want those health perks to backfire, right? That being said, I’m happy to have you over for a nightly hot toddy fix post Thanksgiving as well. You know, to keep the good health and good vibes going all through winter. And for those who don’t drink (or are pregnant), I’ll make yours a virgin. Still tasty with similar HEALTH perks. Would you be up for that? Good, now I’ll go get the stovetop ready! 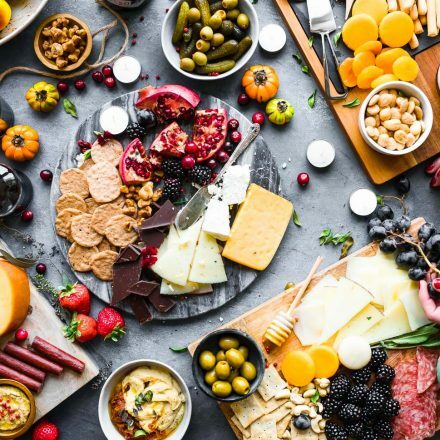 Favorite Holiday Cocktail? Do tell! 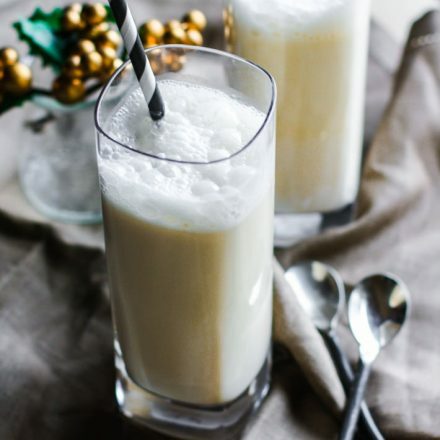 Healthy Coconut Milk Eggnog Steamers for Two! You’ve outdone yourself! And I think you need to make this for me this weekend – just saying! 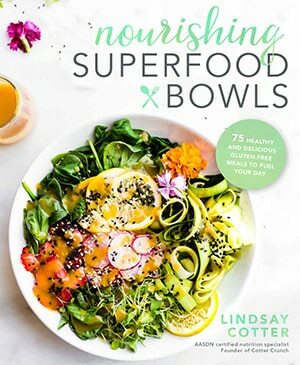 Love that it’s healthy and the pictures are out of this world! um WHY did it never ever occur to me I COULD whip this up virgin?! Yum! I don’t even like to drink and you got me hooked! Fruit juice makes this breakfast appropriate, yes? Hot cocktails are a MUST at this time of year. In fact, it’s Friday — I’d like one NOW! 🙂 Cheers! I’ve never had a hot toddy! But, Ray’s dad makes this Swedish concoction of red wine and liquors and spices each year during the holidays, so strong, but so good. oh man, i want ray’s dad to make me that!! please? You better believe I’d be up for that! Just be gentle — it’d be my first time 😉 I’ve never and a hot toddy before, but now you’ve got me all sorts of intrigued. this would be perfect post snowboarding in the mountains…. DO IT! YES – I am coming over for a virgin hot toddy! 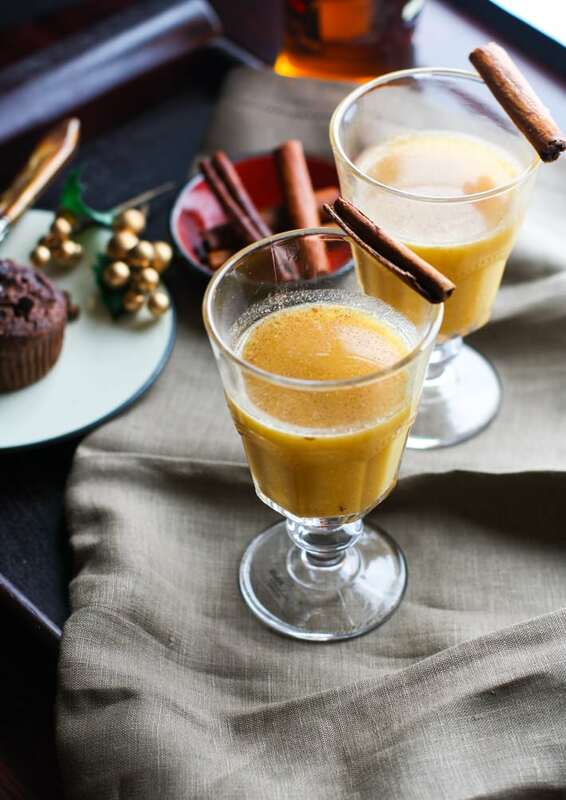 Imagining that “citrus all bundled up with cozy cinnamon and a hint of honey” with the pineapple and coconut cream is intoxicating! Hehe – no pun intended! Woah, this looks amazing!! 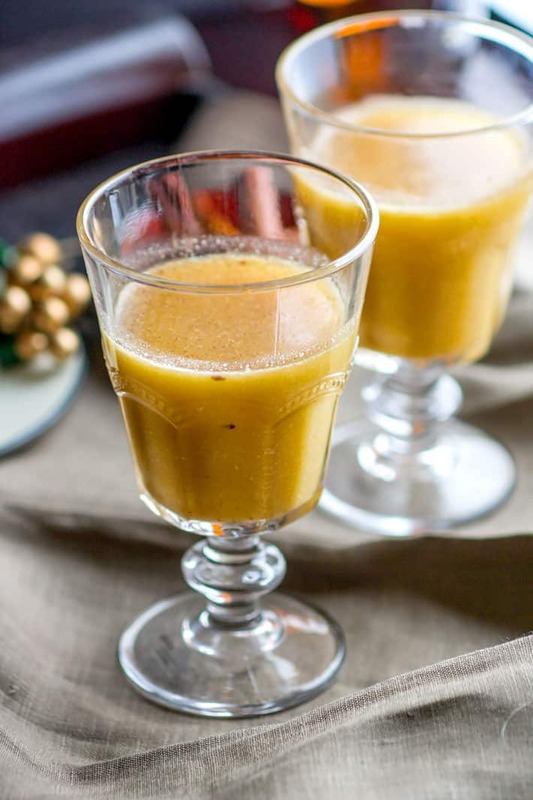 Love that you replaced the sugar with pineapple juice, and the coconut milk gives it a tropical yet holiday festive feel 🙂 Gorgeous pictures too! I’ll take all the immunity boosters I can get during the holidays too! 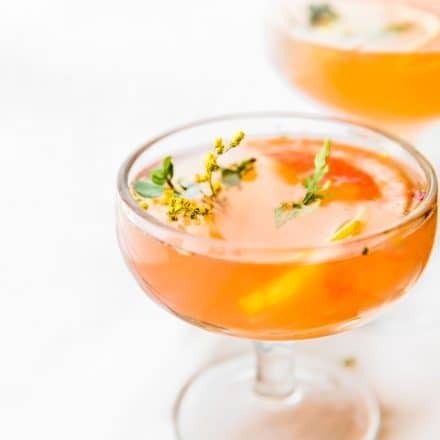 You know I love hot toddies – this looks amazing!! Cheers! Beautiful photos! I love hot toddys and I swear that they do keep winter colds at bay. Totally! a must for winter. You know… I’ve never had a rum toddy. This must change. Yum this sounds amazing! Perfect for a holiday cocktail. Um, YUM!!! Psyched to learn that rum is a superfood 🙂 I’m all about this! yep! so we better make it a daily consumption. Kidding.. kinda. Pineapples always remind me of summer and cinnamon always reminds me of fall. I think this is the perfect combination, because I love summer-ish drinks year round. Getting in some vitamins while having some rum is never a bad idea either. What if I don’t want the virgin version…holy hell that’s a tongue twister. I love the sound of this drink, with or without the rum, even though I’d prefer the latter. Also, I adore pineapple and add frozen pineapple to my morning smoothies for my sweet factor and also the magical benefits of it. Super food indeed. You’re on a roll, my friend! omg this could possibly be the best looking cocktail I have ever seen. pinning it and definitely making it for christmas. gahhhh I am drooling. awesome! let me know if you do! You’d love!! Next winter for sure! So good! Just was reminded to make these again soon!